The Cleveland Federal Reserve | The|Coinologist. Being a Buckeye, and knowing the love my Father had for our home town, Cleveland, Ohio. I always enjoy finding historic things from this great city. The Cleveland Federal Reserve is a true piece of architectural and design history. It had taken four architects thirteen months and a thousand sketches, plus a team of draftsmen creating 1,924 blueprints, to prepare for the moment of groundbreaking for the new Cleveland Federal Reserve Bank. Two years and $8.25 million later, the Bank was completed. Fronting two hundred feet on East 6th Street and 216 feet on Superior Avenue, the thirteen-story building is a modern adaptation of an Italian Renaissance palazzo, or fortress palace. At the sidewalk level is a base of granite from Stonington, Maine. The remaining exterior of the building is covered with marble, a pinkish stone quarried in Tate, Georgia. The stone closely resembles granite and retains a warm color when weathered. On August 23, 1923, the day the doors to the new Federal Reserve Bank of Cleveland opened to the public, an estimated 40,000 visitors passed through the building. They were welcomed in the bank’s golden Italian Renaissance lobby, which is still one of the most spectacular interiors in the city. When the Federal Reserve Bank was planned, the founders were concerned about possible attacks by mobs, anarchists, and the usual assortment of bank robbers. As a result, steps were taken to provide as much security as possible, with the emphasis placed on guns and firepower. The main vault is housed in its own building, constructed before and completely separate from the main bank because of its size. The concrete walls are 6 1/2 feet thick, reinforced throughout with an intricate, interlaced type of fabricated steel. It is said to be the largest vault-door installation in the world. The door is 5 feet thick and has a 47-ton, 19-foot-high hinge. Yet, despite its 100-ton weight, the vault door is so precisely balanced that one person can swing it closed. In 1922, transporting the door from its manufacturing site in York, Pennsylvania required the largest railroad flat-car in America and nearly a month of travel to cover the 350-mile distance. A crew of twelve men took two days and two nights to unload the frame when it reached the train station on East 55th Street and Euclid in Cleveland. This building was created when America was still a manufacturing giant, times might be different, and the Federal Reserve system itself is under scrutiny. One thing we can’t question is the economic power that made these buildings come into existence. East 6th Street Entrance of Federal Reserve Bank of Cleveland. View of the 17-ton door and vault at the Federal Reserve Bank of Cleveland in the basement of the Williamson Building, 215 Euclid Ave. The Cleveland Federal Reserve Bank conducted operations here between 1914-1923. Armored truck in front of the Cleveland Federal Reserve. Bonds being received and stacked on shelves, Fed. Reserve Bank Vault. 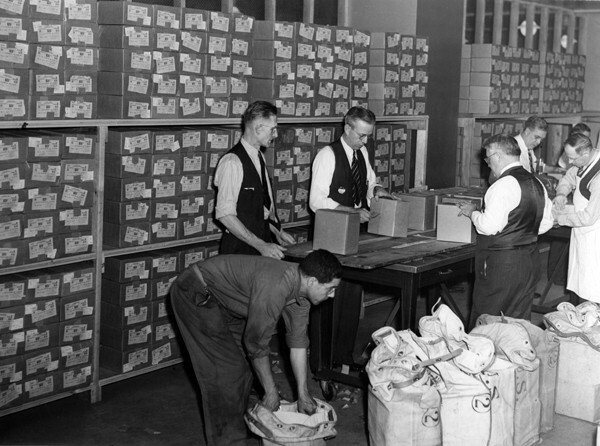 1942 Money in sacks piled high at the Federal Reserve Bank of Cleveland. 1940. The vaults in the Federal Reserve Bank of Cleveland at 1455 East 6th Street. Designed by the architectural firm of Walker and Weeks, the Bank moved into its present location at the corner of Superior Ave. and East 6th St. in 1923. Employees seen wheeling a trunk from the vault at the Federal Reserve Bank of Cleveland in 1959. HostingForWebmasters.com - How does the Fed increase the money supply? Many memories as I used to work at the FRB in Cleveland on the 9th floor with the economists as a graphic designer but also burned money in their furnace. Amazing place with much history. I was blessed to see so much more of the bank than most get to see as part of my research there for an annual report in the 60’s.